USAC issued Wave 32 on Friday, November 16th. Cumulative funding as of Wave 32 is $1.91 billion. The FY 2019 administrative window is open and will remain open until at least January 7th. EPC entity profiles will be locked for the duration of the Form 471 application window (expected to open mid-January). For additional information on the administrative window, see the USAC webinar titled Updating Applicant Profiles in EPC to be held November 20th. The listing for “Eligible Voice Services,” for which discounts were phased out as of FY 2018, was removed. An additional note clarifies that dedicated voice channels on ISDN circuits — as opposed to dynamically-assigned voice channels — are not eligible. 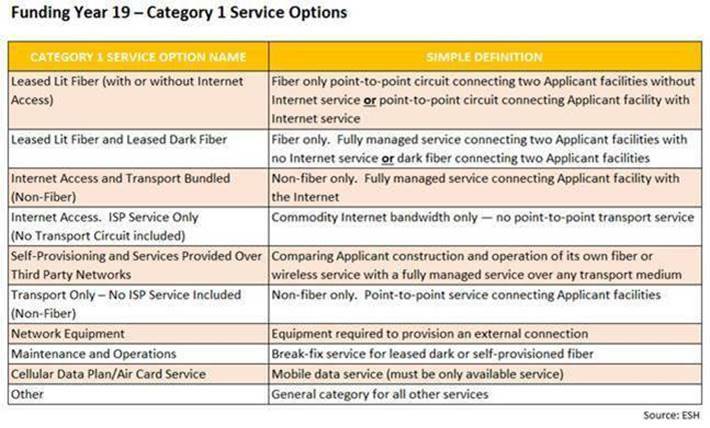 A confusing note was eliminated to clarify that Category 1 network equipment necessary to make broadband service “functional” is eligible even if leased or rented from the service provider. A footnote indicates that lease or rental fees are also eligible within Category 2. The FCC reaffirmed that “redundant” Category 1 services are ineligible. Category 2 services were reorganized to more closely match the associated pull-down menu options on the Form 470. Nothing similar was done to address the confusion on Category 1 Form 470 menu options discussed in the article below. A parenthetical note was added to clarify that “applicants should request software in the same category as the associated service being obtained or installed.” Importantly, a footnote warns that software “upgrades and patches” (i.e., not included with the original service) are considered basic maintenance. A review of the growing number of Form 470s for FY 2019 indicates that there is still confusion, particularly among smaller applicants seeking only Internet services, as to the proper choice of pull-down options. As discussed in our newsletter of July 2nd, the Form 470 for FY 2019 included short parenthetical comments to some of the Internet and transport options, and did add a separate section entitled “Information on How to Seek Bids for Different Services,” but did not change the basic menu options that are causing applicant confusion. Used properly, this option is typically appropriate only for larger applicants already connected to a broadband network and contracting separately for high-speed Internet capacity. Smaller applicants, often receiving Internet via cable modem service, need to be applying for both Internet and transportservices. “Lease Lit Fiber” for fiber circuits with or without bundled Internet services. Form 471 applications seeking discounts on services not properly requested in associated Form 470s are likely to be denied. Applicants who have already filed Form 470s for FY 2019 are encouraged to review the service options chosen — and refile if necessary. The following table, developed by EducationSuperHighway, provides additional clarification on Form 470 Category 1 service options. The Form 470 Category 1 service option tips provided in our July newsletter are worth repeating. If unsure of the transmission media of services to be requested, include all fiber, non-fiber, and Internet options. Consider creating a Customer Service Case, including your “Narrative” text, seeking specific USAC guidance on the proper Form 470 option choices. Adherence to such USAC advice, if provided in writing, may be useful in any future appeal proceeding. November 28-29 Next in the series of two-day USAC annual fall training workshops in Atlanta, GA. Full-day Tribal workshops will also be held November 28th in Spokane, WA, and November 30th in Farmington, NM. FCC’s release of the Eligible Services List for FY 2019 (see article above). November 20th beginner-level webinar on EPC entity profile updates. Last call for USAC training registrations.